Automated Industrial Storage - Phone Us At 800-326-4403 See a video at the bottom of this page! We have placed Automated Industrial Storage solutions nationwide, as well worldwide. With an offering of virtually unlimited load capacities and sizes, our Automated Industrial Storage systems have been a great solution for almost any kind of storage you can think of. Ultimately, it saves you floor space and makes you more productive. Lately mobile shelving has been a chosen solution because it promotes "green building". Since it allows such great storage in such a small footprint it allows architects and designers to build a smaller building. In fact a "greener" building. 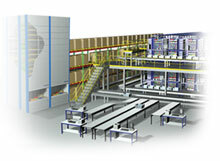 Automated Industrial Storage give a reduced footprint advantage for storage of all types.